Mesut Ozil has taken to Twitter to make a tweet following his omission from the side that will travel to face BATE Borisov in the Europa League on Thursday. As per an announcement from Arsenal before the travelling team was revealed, the German was passed fit and the reason for leaving him out is still unknown. Ozil trained alongside his teammates prior to the trip as can be seen in a picture he posted with the caption "Today's winning team. Training fun." This has got fans furious as they demand to know why the former Real Madrid star keeps missing games for no transparent reason. In response to the tweet, one supporter wrote: "Man is getting paid £350k a week to train only, best job in the world." Another's reply to Ozil's tweet reads: "Not in squad again... What's happening... Fans want to know... I became a football fan only because of you Mesut." 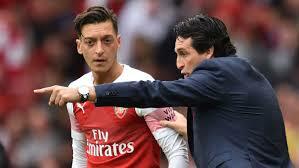 Many have realised that the 30-year-old's non-participation in games is not his own fault but that of boss Unai Emery and have raised questions as to why such a player repeatedly misses action even when it is glaring that the team needs his services. Arsenal head to Belarus to continue their Europa League campaign in the first leg of their round of 32 fixture against BATE Borisov. They got this fixture having emerged group leaders in the first stage.